EXCLUSIVE / Unhappy with press coverage following the recent European Commission report on corruption in the 28-county bloc, a Bulgarian oligarch requested the EU executive's assistance in silencing a critical journalist. Home Affairs Commissioner Cecilia Malmström is supposed to handle the issue. EURACTIV has obtained a copy of a letter, signed by two officials from the Bulgaria’s Corporate Commercial Bank (CCB), to Commission President José Manuel Barroso and other Commissioners and MEPs. One of the signatories is oligarch Tzvetan Vassilev, president of the supervisory board and the majority shareholder. The two CCB officials accuse Svetoslav Terziev, a journalist from Sega daily, for “malicious falsehood” of the Commission’s report on Bulgaria. In the article published in Sega daily on 5 February, the journalist added among the names of the people referred to in the report those of Delyan Peevski, a controversial businessman, his mother Irena Krasteva, owner of the New Bulgarian Media Group Holding and banker Tzvetan Vassilev, whom he calls their “creditor”. The Commission’s policy is avoid putting names in the corruption reports, but the situation and persons described are easily recognisable. “The election of a controversial MP as head of the State Agency for National Security (SANS) raised concerns in Bulgaria and beyond,” the report says, without mentioning a name. It is common knowledge, however, that the attempt by the Socialist-led government to appoint Delyan Peevski, an MP and a shady power broker, has sparked boisterous protests. Terziev only writes that Peevski is the controversial MP who was proposed as head of the SANS. Also, the report says that “media ownership is increasingly concentrated, compromising editorial independence”. As it is common knowledge, the biggest concentration of Bulgarian media ownership and distribution concerns primarily the New Bulgarian Media Group Holding, of which Peevski’s mother Irena Krasteva is the owner, and of which credible press investigative reports suggest Vassilev is the creditor. Terziev mentions their names, which the CCB says is a “misuse of the Commission’s reports for private interests”. “Before we take any steps to defend our good name and reputation of Mr. Tzvetan Vassilev, we would like to receive confirmation that the above-mentioned citation is not part of the European Commission’s report," the CCB officials wrote to Barroso. The leaked letter provides a rare glimpse of Bulgaria’s oligarchs’ approach to media freedom. Tzvetan Vassilev should not be offended by being referred to as an oligarch, because he accepted this appellation in an interview he recently gave to Deutsche Welle. Bulgaria ranks as the worst in the EU in Reporters Without Borders’ 2014 World Press Freedom index, coming in at 100th place globally. Last year the country was 87th. The Corporate Commercial Bank holds an overly large proportion of funds from state-owned companies. This reportedly allows the bank to maintain an audacious crediting policy. According to investigative reports an important beneficiary of such credits is the New Bulgarian Media Group Holding. In exchange, media from this group reportedly pay lip service to Vassilev and Peevski, through publications such as the dailies Politika, Telegraf and Monitor. Eleven chief editors in Bulgaria, representing the Union of Publishers, wrote a letter in 2012 to the Commission, exposing the relation between CCB and New Bulgarian Media Group Holding as illegal state aid. No response has been received so far. Asked to comment, Barroso’s spokesperson, Pia Ahrenkilde Hansen, said that it was up to the spokesperson of Home Affairs Commissioner Cecilia Malmström to reply, as the issue concerned the corruption reports overseen by the latter. She also said that most likely Malmström would reply to Vassilev. Malmström’s spokesperson Michele Cercone stated the obvious: ''We confirm that the country chapter on Bulgaria of the EU Anti-Corruption Report do not refer to individuals by name''. A Commission official familiar with Bulgaria, who preferred not to be named, told EURACTIV that journalists were “free to interpret the Commission reports as they wish”. He also indicated that the Commission tried to make their job easy by describing clear situations and often specifying the function of the person concerned. “Media freedom is an important principle. The names are obvious for those who read the reports and for the journalists who interpret them", the Commission official said. In no way did he indicate that he saw Terziev’s naming of Peevski, Krasteva and Vassilev as inappropriate. Asked by EURACTIV to comment, Svetoslav Terziev said that the main objective of the CCB was “to instigate fear and autocensorship on journalists outside the media empire of Krasteva and Peevski”. He also said that following a complaint by CCB the media watchdog in Bulgaria had ruled on 14 February that his article did not contravene reporting rules, as it distinguished clearly his own words from the report quotes. Terziev is recipient of the 2011 European Parliament press prize as national winner in the category written press. The European Commission published on 3 February a much awaited 40-page anti-corruption report covering the overall situation in the 28-country bloc, coupled with individual chapters on each country, of approximately a dozen pages each. The package is supplemented by a 230-page Eurobarometer survey on corruption. The EU executive said that its rather modest ambition was to launch a debate on the corruption and identify ways in which the EU could help fight the scourge. Corruption is estimated to cost the EU economy €120 billion per year. That amounts to about 1% of EU GDP and represents only a little less than the annual budget of the European Union. The EU executive says it hopes that this effort would trigger a debate and help promote good practices in fighting corruption. Sega daily, Bulgaria: ??????? ?? ???????? : ?? ? ????, ? ????????? Sega daily, Bulgaria: ?? ? ??????????????? ?????? ??????? ??? Sega daily, Bulgaria: ??? ?? ??????? ?? ?. "????" ?? ???????????? ??????? ? ?????????????? Bivol, Bulgaria: ????? ??????? ????? ?????????? ?? ????????????? ? ???? ?? ??????????? ?? ??????? ?? ??? Kapital, Bulgaria: ??????? ?? ??????? Kapital, Bulgaria: ??? ????? ??? 86 ???. ??. ???? ??????? haha. You vant a pesky journalist silenced? No problem, komrade. Freedom is what bulgarians oligarhs have and oppresion is what all others bulgarians have. 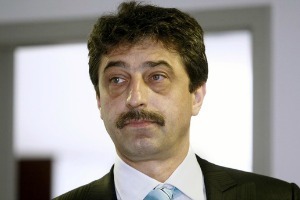 Tzvetan Vassilev is the face of the mafia in Bulgaria. The government obeys to him. Tzvetan Vassilev is connected with Peevski, Krusteva, Stanishev (the leader of PES). Vassilev controls lot of newspapers, internet sites and the television TV7, also a lot of journalists. Everyone in Bulgaria knows that! Now he tries to frighten the independent journalists. No wonder . Barroso is called ‘neoliberal’ , and the current neoliberal representatives of the new financial – corporate oligarchy , which Mr Tzvetan Vassilev serves – the right- hand of Bulgarian Fed – banker Tzvet?lina Borislavova . Financial- corporate oligarchy has only in neoliberal countries U.S., UK , Russia, partly in China and some countries in southern Europe, where the rule of law works poorly or not at all – Greece, Italy , Spain, Portugal. European neoliberals received their neolberal credo from American oligarchs whose oligarchic social model and economic interests in Europe rubbed succeed where the rule of law works poorly or no at all. T’ are known as do not like democracy and tend to jump its both leverage – political pluralism and freedom of the speech. Vassilev is a terrible man, insuring protection to whoever is in charge by using his rich media outlets funded by the government and EU funds via ads. He recently purchased a tobacco factory that in the first year got as much profit as the price he bought it for. He’s now having a country-wide race to gain monopoly on newspaper and tobacco distribution. Actually, it’s relatively easy to spot a classic oligarch with heavy pro-Russian ties in Bulgaria. It’s the moustache! Then who the hell else are you talkin’ to? Well I’m the only one here.